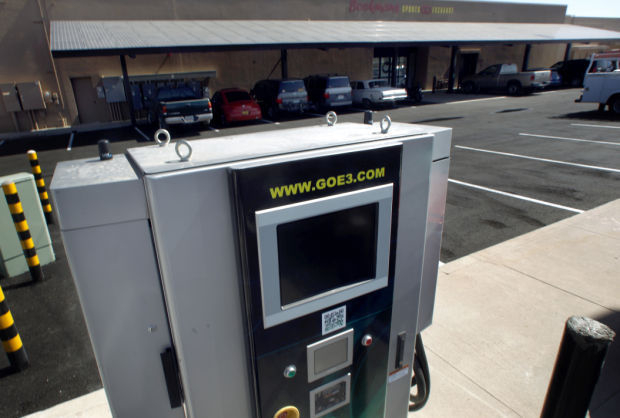 MESA, Ariz. – (September 1, 2013) Tucson EV drivers can now charge up in as little as 20 minutes thanks to the city’s first public EV fast charge station installed by Arizona based company, GOe3, at Bookman’s new Speedway store – 3302 E. Speedway Blvd. The new EV station not only provides convenience to city drivers who just need to charge up during daily errands, but also completes the circuit of intercity mobility between Phoenix and Tucson. With the help of GOe3’s Picacho Peak E3 charging station installation last year, most EV road travelers can now traverse the two cities with very little stopover time. This installation is part of GOe3’s plan to create a 1000 unit Electric Highway, powered by Eaton, which will make fuel-free coast-to-coast travel a reality for all EV drivers. “With recent efforts from many car manufacturers to make EV models more affordable, this is the ideal time to help build the infrastructure to support range confidence,” said Bruce Brimacombe, CEO of GOe3. Charging at Bookman’s is free until October 1st, and $5 thereafter to fast-charge EVs with CHAdeMo plugs, such as the Nissan Leaf and Mitsubishi i MiEV. Tesla drivers can expect to pay $13, when a standardized Tesla plug becomes available. As technology changes, GOe3 charging stations are designed to quickly adapt. Soon models such as the Chevy Spark and future models adopting standardized SAE plugs will be able to utilize GOe3’s Level 3 quick charge technology. Level 2 charging will remain free at this Bookman’s location. A longtime supporter of electric vehicles, Bookman’s owner Bob Oldfather, has offered free Level 2 charging at his Tucson and Phoenix locations for the past few years. Further demonstrating his support of alternative energy, the new Bookman’s store features a 50-kilowatt photovoltaic array, which supplies much of the energy for the store and charging station. Committed to its mission of promoting electric vehicle adoption in America, GOe3 recently began filming a docudrama film, following the company’s journey to install EV Fast Charge stations across the country. The film is expected to premiere in about 600 theaters throughout the United States later this year. GOe3 is changing popular perceptions about renewable energy by demonstrating to America the viability of electric vehicles. Its proprietary EV Fast Charge Station design is providing coast-to-coast infrastructure needed to support increased “range confidence”. Its unique multi-faceted business plan monetizes EV charging, creating a sustainable network of stations to support exponential growth. To learn more about GOe3’s fast charge stations and business loyalty program, as well as its docudrama, National EV Road Rally, and reality TV show currently in development, please email info@goe3.com.